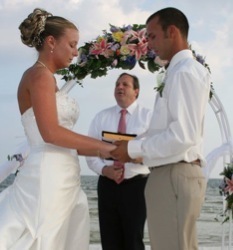 Weddings and Vow Renewals are among the most important events in our lives. You want your wedding day or vow renewal to be as special as it can be, a beautiful, memorable day to carry you into a lifetime of joy and shared happiness. We want that, too. CB Weddings approaches each and every ceremony we perform with the goal of making the event as positive and stress-free as possible, creating a wonderful experience from which to begin your lifelong commitment. We work with couples to create a ceremony that reflects their beliefs and satisfies their values. With our ordained, nondenominational Ministers, we can provide a ministerial ceremony that honors your faith or beliefs. We’ve performed hundreds of ceremonies for couples including traditional to modern denominational or nondenominational, and we’ll make certain that your ceremony reflects the unique essence of your faith. Some couples prefer a simple civil ceremony with a Florida Notary Public providing officiant services, and we’re happy to offer those ceremonies as well. For us, the most important issue is making the day special. Getting married can be stressful enough, as it is. There’s no need to have to worry about the details of the ceremony – when you’re supposed to speak, where you’re supposed to stand, what cue you’re supposed to follow. We take the stress out of the event by guiding you through the ceremony. When it comes right down to it, you really only have to remember two words on your own. We’ll walk you through the rest. CB Weddings would be honored to be a part of this important event in your life.